Click here to visit Skoshbox! 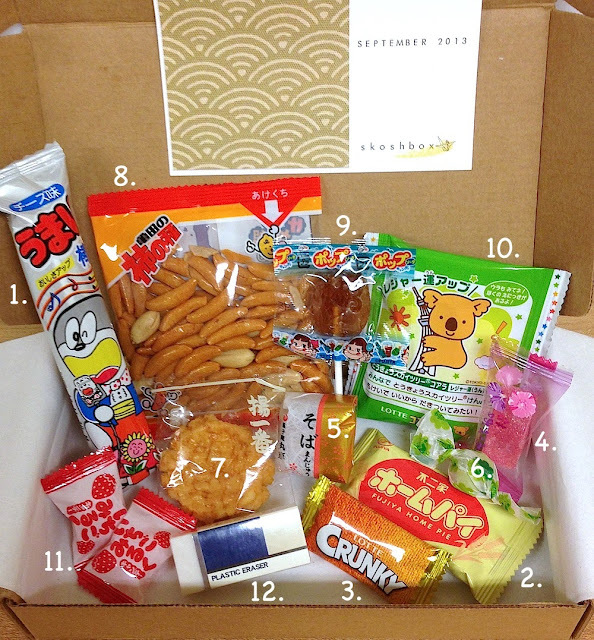 A few days ago I received my first Skoshbox--a Japanese treat subscription box! This service is provided by two ladies in Hawaii (I think?? Maybe?? They have Japanese mommas and visit Japan often!) and only costs $12 total with free shipping! The little box (about the size of a hardcover book) comes full of Japanese snacks and a little stationery tidbit (or last month people got a pair of nice chopsticks). Because I've been in love with Japan since I was 12 (which is a long time ago now) and because B lived in Japan for several years, I thought this would be a fun thing to try! Also because I have this blog I thought some of you might be interested--especially those of you who like anime and manga or Asian stuffs in general! So each month after I receive my awesome little Skoshbox, and B, Smalls, and I have sat down to taste each treat (minus the non-edible, of course) I'll post a quick somethin' somethin' of my impressions. If you're interested in buying any of these items simply copy and paste the food name into a search engine and you'll find several online stores that sell them--or go to your local Asian market if you have one! -Light, puffy corn, like a cheese puff /doodle but in cylinder form. Thick orange powdered cheese coating, powerful (like mac & cheese powder). *B loooooves umaibo. He's told me about them several times in the past. Now I've finally gotten to try one! I think this was Smalls favorite as it's easy to hold (it's a puffed stick!) and the flavor was cheeeese. Yum! -Like shortbread or pie crust, buttery, flaky, light. Sprinkled with sugar. Very nice. *I really liked this because it really is like eating pie crust, baked perfectly. -Milk chocolate with puffed rice bits inside. Nice flavor. Reminiscent of Nestle's Crunch or Hershey's Krackle bar, but lighter. *This is another of B's favorites. He's mentioned it several times when going down memory lane. I found it for him once in a big Asian market, so I've had it before and liked it. Note: this is actually from the Korean company Lotte but is very big in Japan. -Firm pink jelly coated in small sugar crystals. Teeth sink in nicely. Very subtle flavor--perhaps flower? *This was satisfying to eat. -Creamy hard ball with slightly chewy outside. When you chew the whole thing in your mouth it softens up a little. It's like another candy that I can't think of at the moment...The flavor was green tea (matcha) but I couldn't really taste it. *This was okay, but I wasn't thrilled about it. Just kinda' "meh". -Slightly puffed rice cracker with a good crunch. Light savory flavor of soy sauce. Very nice. *All three of us liked this! We've had senbei before, like the plain kind that has a little salt, a little sweet, but this one was all savor and it was great. -Smooth & shiny on the outside with a crunch & a strong, pleasant spice flavor. There are peanuts in the mix that accent it well, a calmer flavor to go with the spice. *I ate all of these. -Thin, hard candy lollipop with a cola flavor. -Little cookies/biscuits in the shape of Koalas filled with chocolate cream. 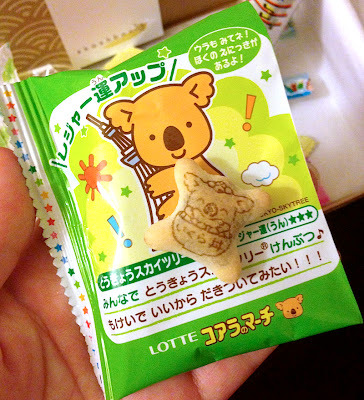 Each cookie has a cartoon koala image printed on the front. Not overly sweet, fun dessert snack! *Have had these so many times in the past and love them because they're so cute! The taste is fine, but the real pull is the cuteness factor. Smalls likes these a lot too. These are so common you might even find them in your grocery store (next to the yan yan, poky, & rice candy). -Hard candy, strawberry flavored. Kind of like jam in your mouth with a touch of cream. Nice and not too sugary. *I haven't unwrapped it yet, but I'm pretty positive that it's a great eraser. I've owned erasers like this before to use on pencil drawings and the erase was great.